The US equity market was weighed down versus other markets as a result of growing fears towards new developments in the US-China trade war. Fresh country air and my first mid-afternoon doze in front of a fire since last winter were among my weekend highlights. Having had a very hot summer (no complaints here), I will happily be the first to make a dramatic forecast that we are going to have a very cold winter. (I have based this entirely on how difficult I found it to get out of bed this morning). While there is no doubt the weather has been cooling down, last week saw the US-Chinese trade war continue to hot up. Asset class returns in sterling and local currency are below; most notable are the positive gains across the board in equities, while both UK and US government bond yields rose creating a negative return for their respective indices. The US was outshone by strong performance across the other regions last week, with Japanese and Latin American stocks in particular leading the charge and rising over 4%. 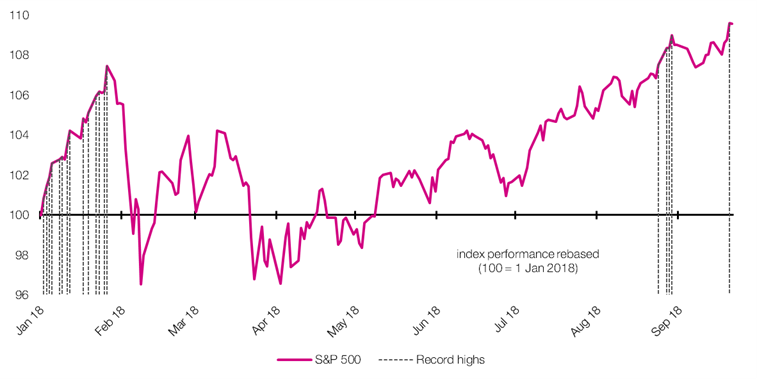 As the relative underperformer, the US equity market was weighed down versus other markets as a result of growing fears towards new developments in the US-China trade war. Monday’s announcement by the Office of the US Trade Representative revealed the firm decision for a 10% tariff to be imposed on $200 billion of Chinese imports, along with the forward guidance that the tariffs would be increased to 25% as of January 1, 2019. This came with a further warning from the US President that should China take retaliatory action, the US would immediately pursue tariffs on an additional $260 billion of imports. Chinese officials were fairly quick to respond, noting that pressure tactics by the US were not going to gain concessions in wider trade negotiations; Beijing has subsequently announced its intention to impose duties on $60 billion of US exports as a retaliation. Despite this announcement, the US market hit a fresh high last week, highlighted in the chart below, perhaps indicating that market participants had been anticipating a more severe announcement between the two economic superpowers. One such example of why investors have been able to breathe a sigh of relief has been the Chinese Premier pledge that China would not devalue its currency to stimulate its exports in the face of new US tariffs, thus reducing the risk of a damaging currency war. While higher levels of confidence have helped equities notch a positive week, the increased optimism also affected US government bond yields with the benchmark 10-year (generic bond yield) breaching the key psychological barrier of 3%. This move is highlighted in the asset class return tables above as a fall in the US government bond index, reflecting the fact that as yields go up bond prices go down. Over a number of years, US yields have been suppressed by a range of factors including slow economic growth and loose monetary policy by the US Federal Reserve. 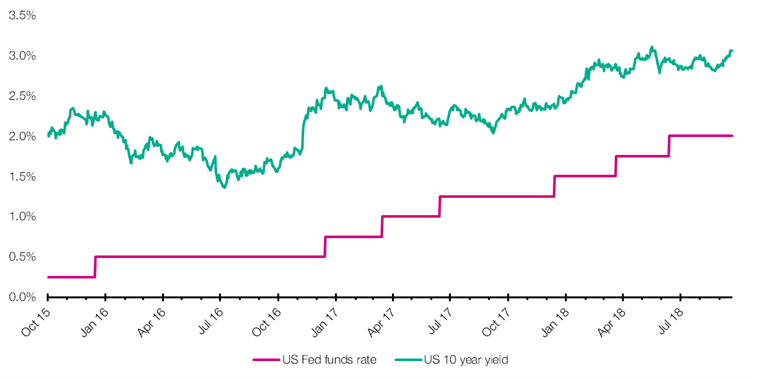 With recent data releases out of the US showing the economy is still expanding with no signs of a slowdown, the Fed has been keen to continue on its path towards policy normalisation by raising interest rates and running down its post-quantitative easing balance sheet. Worryingly, over the weekend Chinese officials declined an invitation from the US to discuss further trade policy, citing the fact that they believed “US actions have seriously damaged [bilateral] relations”. This implies that there is no end to the current trade war in sight. 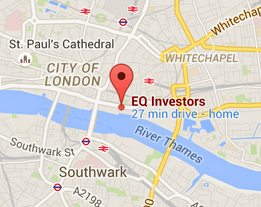 As such, we will be looking to the minutes following the FOMC meeting later this week. In particular, we will be reviewing how their economic projections differ from that of the market which may give us a clue as to intentions around future monetary policy. STAT OF THE WEEK: 60% – the percentage of people who think other people don’t care about facts anymore, instead thinking others just believe what they want (Ipsos Mori).